Use this Choice 3 qt. stainless steel mixing bowl with its silicone non-slip base to add a great, useful addition to your kitchen. Featuring a thin coating of silicone on the bottom, this bowl is a step-up from your typical mixing bowls as the base stops the bowl from sliding around on your counter or workspace. This helps prevent common kitchen spills that can occur when stirring or moving about a busy kitchen. Plus, since the non-skid base is made of silicone it resists heat and chemicals better than plastic for long-lasting durability. The 3qt stainless steel bowl with silicone bottom is the perfect size for general kitchen use. Large enough to easily mix small batches of cupcakes or pancakes, yet small enough to whisk a few egg whites. Definitely one of the most versatile bowls in the set and I'll be buying a 2nd as often as I use it. This is a real heavyweight bowl! This amazing bowl is just perfect for my pastry kicthen. The size allows a good quality of flour to be used at once without having another bowl on the side! And best part is, the bottom base is made out of a rubber material which allows this bowl to avoid any slips. Highly recommend it! I have I believe ever size of these bowls that Webstaurant Store offers. Webstaurant offers a great variety of size. All to accommodate anybody’s needs. That how great these bowls are. They are very durable and made to last. The price will fool you. Due to the price being so cheap. Please believe. You will not have any regrets in buying them. I use them for everything and do everything in them. From mixing to make cake batter. To prep for tomorrow meal. If I need my prep immediately or put these bowls in the fridge or freezer. The bowls are very convenient and ready for my use. The bonus with these bowls is the rubber bottoms. The bottoms help give stability. While you use your two hands for other necessities at the time using these bowls. This bowl is perfect for mixing powders that can easily escape. The high edges to the bowl help keep powder and dry ingredients from escaping while mixing. I made myself a set with these non-slip bowls (items: 922MB03-EA, 922MB05–EA, 922MB08–EA, 922MB15–EA) and I love them! They meet all my home baking needs and I love that they are dishwasher safe! This stainless steel bowl is great . The rubber bottom helps it grip the work place. I really like the size of it too. Is easy o clean. 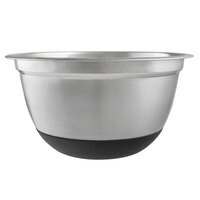 This bowl is sturdy, and unlike the plain stainless bowls, has a great non slip base. When doing anything really heavy it will still slip a little, but overall a good buy. For the price it will stand up and take some abuse, so it is definitely worthwhile in a busy kitchen. Cleans easily, I just throw mine in the dishwasher. Rubber bottom mixing bowls are the best! So much easier to use when they aren't sliding all over the counter. This is a good bowl for whipping up sauces or mixtures. I love this bowl so much...very well constructed and the silicone base makes my life so much easier. I can mix and fold my bathers with one hand. I highly recommend this item. These mixing bowls are about as good as you can buy. They have nice brushed steel on the outside and a non slip rubber base on the bottom so they dont walk away when mixing. The 3 quart heavy weight stainless steel bowl makes it very convenient to mix anything you'd like. It is heavy weight that when you're mixing it will not move around. Nice solid bowl. Stacks easily inside the larger bowl and hold quite a bit. The higher sides are helpful so our students are less likely to spill. The non stick base is awesome. This is a great everyday sized bowl. I like to use it for sifted flour while baking. The plastic grip base makes it a stable bowl to use for potentially messy things. I bought 3Q and 5Q stainless steel mixing bowls. They are light, easy to clean and store. I really like the non-slip base. I will be buying more. Nice size mixing bowl, big enough for a whole cake mix with added ingredients. The non slip coating rubber base is convenient when adding liquid to the mix while stirring. It helps keep it where you need it. I absolutely love this bowl. I purchased it in several sizes as well. It is lightweight and easy to lift. hold and put away. The non-slip base actually works great. I don't know why I ever doubted that it would, but after many uses it still works to keep the bowl from scooting around on the counter while mixing ingredients, etc. This is my go to pancake mixing bowl, and every day mixing bowl. This is a great mid sized mixing bowl. I absolutely love the non slip base. It makes it so easy to mix with only one hand. I find myself singing the praises of these heavy-weight / grip bottom stainless steel bowls quite often. They are light enough to handle with ease and stack away on a tall shelf, but also weighty enough to feel durable in-hand and stand up to heavy use in my busy home kitchen. This 3-quart size is great for 'prep-to table' use ... I find myself reaching for this particular bowl time and time again. Great little bowl. I love the height of the sides and the heavy duty gauge of the steel. The grip on the bottom helps work the contents. Love this mixing bowl. The bottom is silicone and will stay put on the counter when in use. It is made of durable heavy duty stainless steel, has a nice finish and design and the large rim makes holding it securely easy. Wonderful bowl! I got this bowl, plus the 5 quart and the 1.5 quart ones, to replace an old set of melamine bowls. They're super durable and nest perfectly (great for my tiny kitchen cabinets). Another high quality item from Webstaurant! These non-slip bowls really work and stay put on the counter top. We've got one of each size and they are all invaluable. I absolutely love these bowls - the base prevents it from gliding all over. I bought these a few weeks ago and have already used it several times! Make sure to wash and dry promptly to keep them looking shiny and clean. I was hesitant to purchase due to such low price. These same bowls in Big Brand stores easily go for 3 times the price. I thought they would be cheap and flimsy. They have been great! The rubber bottom holds on well to the counter and the thicker bowl material gives you confidence. I love that this bowl doesn't move around on the counter top when I am mixing my dressings. I really like using metal when mixing anything with oil, as it cleans us so much easier that using a plastic bowl/container. We really like these bowls and should the need arise we'll order more in the future - these exact same ones. They are affordable, durable and function perfectly for our needs. I love this and need more. I never thought of the bottom non slip base until I ran into this item while placing an order. Worked great!! I love the size and deeper shape to this bowl. The bowl does not move while mixing or using. The inside of my bowl has scratched up a lot, but I would expect that in a stainless steel mixing bowl. It is the go-to bowl in our kitchen! A nice size and shape for mixing without all your ingredients ending up on the table. The non-slip bottom keeps the bowl just where you want it. These smaller bowls are perfect for no slip stirring. They hold just the right amount of a few cups of dry ingredients before you mix them with the wet ingredients. They hold up well after multiple washes too. I would like to shake the hand of the genius who added the rubberized bottom to prevent slipping while mixing in this bowl. I warn all who may purchase this that it is very hard to switch back to using a different bowl. The steel is of a thick gauge, the quality is great, the price is great, and did I mention that the base keeps the bowl steady when mixing on the counter? One of the best purchases I have made. Comes in multiple sizes. Good size bowl, lightweight, easy on your wrist for everyday use. I got this size and the 5 qt and have been using them everyday. The 5qt heavyweight stainless steel mixing bowl with bottom grip/non-slip base is an excellent purchase. It is sturdy and attractive, and the bottom grip keeps the bowl from sliding. I plan to purchase more of these in different sizes soon. These bowls are just gorgeous. I bought them to use as mixing bowls for my daughter as she's setting up her new kitchen and I'm back on the site to buy myself a set. They grip to the counter pleasingly and best of all they won't scratch the counter. Love these- 5 stars! A great bowl I use it practically every day. The non slip bottom is great. I can whisk or mix in this bowl without it moving all over the counter. The Qt. Extra Heavyweight stainless Steel mixing Bowl with Bottom Grip / Non - Slip Base.I love mixing my ingreadents with theis bowl it won't slip out of my hands yea. This bowl is awesome!! Its great for making dressings. Pouring oil and whisking at the same time can be challenging but with the non slip base the bowl is firmly in place. This bowl has held up very well after repeated uses and washes. The no slip base has been a life saver especially when our prep table gets wiped down...no slipping and sliding off the table.